Pears and honey are a sweet compliment to the mix of savory flavors in this Asian-inspired dish. Whisk together honey, soy sauce, sesame oil, ground ginger, garlic and red pepper flakes until blended; set aside. 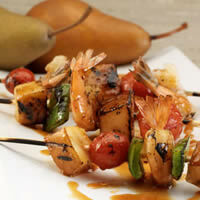 Arrange 3 cubes pear, 3 shrimp, 1 pepper square and 1 cherry tomato on each skewer. Place skewers in large shallow pan. Pour marinade over kabobs and refrigerate for 1 hour. Brush grill with oil. Preheat grill. Grill kabobs over medium heat for 3 to 5 minutes on each side until shrimp is cooked.